Produces lots of semi-early fruit. Medium to large in size and medium in firmness. Very nice, sweet dessert quality flavor. Performs well all over, especially in California and the south and east coasts. Great taste and the most popular variety for home gardeners. Will yield large deep red fruit. 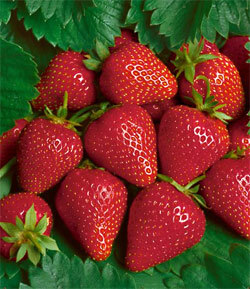 Plant both Everbearers and Junebearers to enjoy fresh strawberries all summer long. To avoid flowering and fruiting stress on young plants, flower buds should be removed in the first year. Removal of flowers will allow the plants to direct their energy toward establishing a root system and developing a healthy, large leaf canopy to fuel next year’s crop. Junebearers produce a single crop each year during a 2-3 week period. Lot of 10 strawberry plants.